A few weeks ago my friends and I got together at a Mexican restaurant. Have you ever noticed how great they are for large groups? Every time I go with a group of friends or family, its a fun, interactive night. Besides the company, one of the best parts of going to a Mexican restaurant is the free salsa and chips. 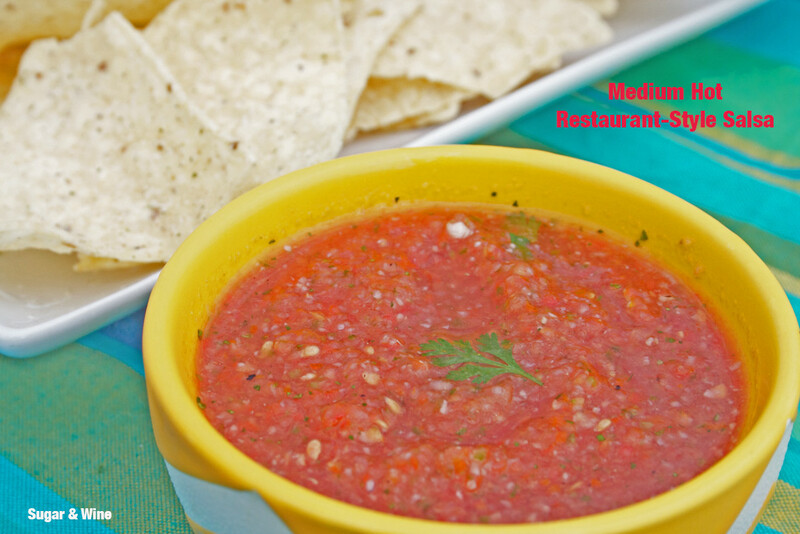 The salsa is almost always the same: light and delicious. And, without a doubt, we eat several baskets of chips and salsa and then remember (sometimes too late) that we have a gigantic plate of food coming. With summer in full force and the garden doing great this year, there is no reason why this salsa needs to stay at the Mexican restaurant. I thought it might be a little more difficult than it actually was. I figured I would be cutting and chopping and dicing forever. This recipe is great because you can make a few slices and a little chopping, throw it in the food processor (or bullet) and pulse. So, 10 minutes later I had salsa. I like spice and I prefer my salsa a little hotter. If you don’t like the heat, reduce the jalapenos in the recipe and certainly don’t add in seeds or membrane (the white stuff). Now, go invite your girlfriends over for beer/margaritas and salsa tonight after work and enjoy a little at-home fun!